Imagination Technologies, a company that specializes in making PoweVR series GPUs installed in mobile devices like iPhone/iPad etc that yields impressive raw performance, has now announced their latest creation - the PowerVR G6630. It is asserted by the company that the PowerVR G6630 would not only be the fastest GPU, but will also be 60x faster than their previous generation cores. 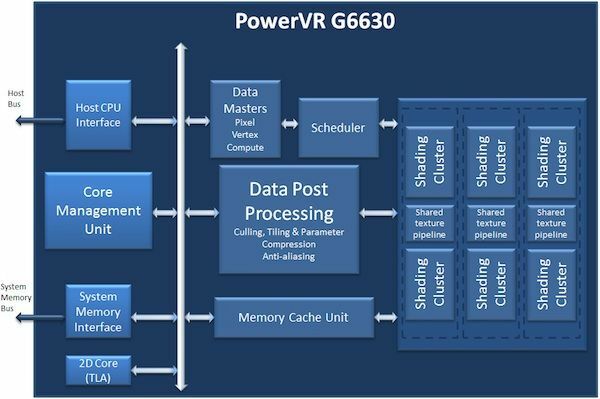 PowerVR G6630 is set to outscore all its competitors like NVIDIA’s Tegra 3 or Mali’s T series. Specs wise, PowerVR Series6 GPU will have six cores which are designed to offer raw processing performance from 100GFLOPS to more than 1 TFLOPs.